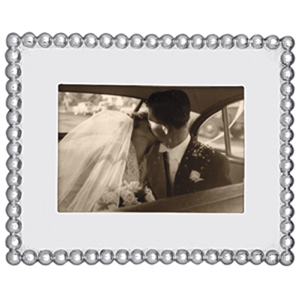 Display your favorite snapshots in this classic and timeless picture frame. Part of Mariposa's String of Pearls collection. Designed by Michael Updike. Handmade in Mexico of recycled sandcast aluminum. Dimensions: Picture Frame - 7" H x 9" L, Photo Opening - 4" H x 6" L.
Photo Size 4" x 6" 5" x 7" 8" x 10"